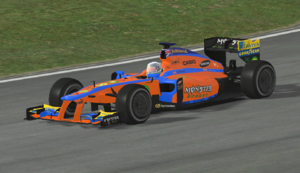 The Downton BD05 was a Formula Virtual racing car designed by Downton to compete in the 2017 Formula Virtual season. It will be driven by 2013 World Drivers' Champion Nathaniel Powers and rookie Klaas van Snelheid. The car was launched at Thruxton Circuit, Downton's local track, at an event attended by 15,000 fans. Following a signing and photograph session for all attendees, two cars were rolled into the pit lane and uncovered in front of 100 prime ticket holders before both Nathaniel Powers and Klaas van Snelheid took their respective cars for two shakedown laps apiece. This page was last edited on 18 March 2018, at 00:06.